View Your Entry in Our Roll of Honor! As a fitting tribute to our Members of Together We Served, your service to our country is now honored in our Roll of Honor, the most powerful online display of Living, Fallen and Deceased Veterans existing today. Our 1.67 million Veteran Members, who served from WWII to present day, now have a dedicated entry displaying a brief service summary of their service and their photo in uniform if posted. You can find your Roll of Honor entry easily – click on the graphic below and select your service branch. Then enter your name in the Quicksearch window. Alternatively, you can select your service separation year and scroll down. Please check your entry for accuracy and update any information, such as your Last Unit, plus add your service photo for completeness. You can do this by logging into TWS and clicking on the “My Profile” tab. 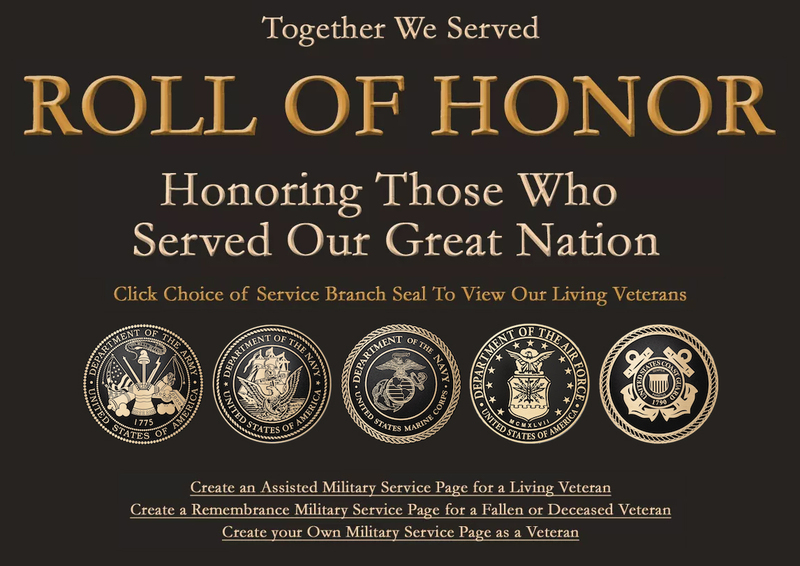 If you have any questions regarding your entry in our Roll of Honor, please don’t hesitate to contact us at Admin@togetherweserved.com or contact our Live Help Desk at the bottom left of your TWS website.